For my diploma exam I have a heat exchanger. And I want to make a 3d model of it and a flow simuloation. Till now I've made everything but baffles and other minor components. But the flow in the tubes is not right. 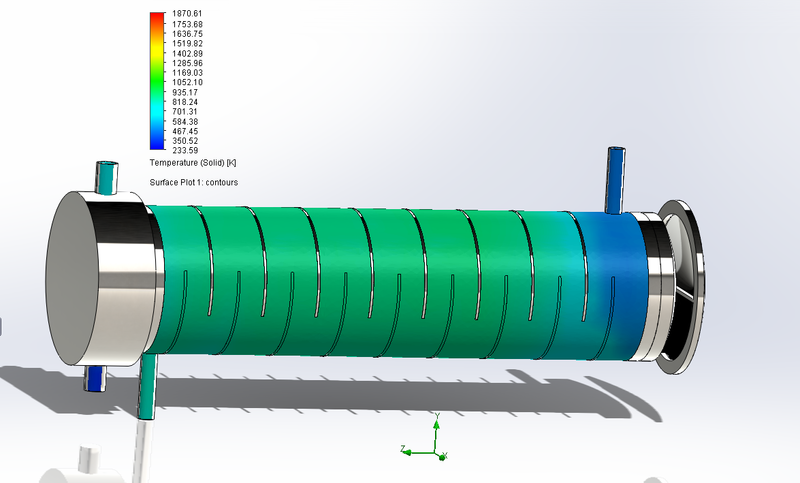 I'll upload the project here and the flow simulation data also. It's like the wall between pass 2 and 3, at the right end of the HX is passed through by the fluid. The particles form particle study doesn't want to enter the tubes, though one time I managed to do it. What am I missing? ps : everything is done in the assembly file. I know the project is pretty big [~100mb] but please give me a hint. le : I have updated my model and the fluid SEEMS to have a good trajectory. But : the temperature at TAME inlet side (you will see in my new model) is still not right, because it is set to be at ~200 C but the plot shows it to be very low. Also the flow through baffles doesn't reach the end. le2: I have another problem too. I managed to get the temperatures change. The T in tubes is right but the one around baffles is rising. This is not possible. It sounds like you have made some progress but it isn't clear where you are at. Could you post an update with some screenshots showing what you are seeing and what you are expecting. If you want to post your model , post a pack and go here. Ok. All I want is that the water getting in at left-down inlet and getting out at left-up outlet [atm pressure] to warm up and the TAME liquid getting in at right-up inlet and getting out at second left down outlet to be colder. The water is supposed to cool TAME and of course to warm up a little. But as you can see both are warming up which is incorrect. Heat transfer seems not to work. Also there is a high temperature scale at 1870 K which cannot be. Tame is getting in at around 200 C. It's not possible to warm up to that temperature. hi, i'm not familiar with that download site, it would be best to just post a pack and go of your model to the solidworks forum using the advanced editor in the top right corner. it might be good to use a cut plot to look at your results instead of a surface plot. also have you set inlet/outlet goals to make sure that your setup is what you expect? i'd also suggest going through the tutorial on cross flow heat exchangers in the tutorial to make sure you didn't miss something.